OldTO is an open-source map tool created by Sidewalk Labs that provides block-by-block browsing of historic Toronto photographs. The tool maps more than 30,000 (and growing!) historic city photographs from the City of Toronto Archives, which holds more than 1.7 million photographs dating back to 1856. Our goal is to help Torontonians discover something new about their street or city. We think OldTO provides a powerful way to visualize the changes that have taken place on a given city block over time. 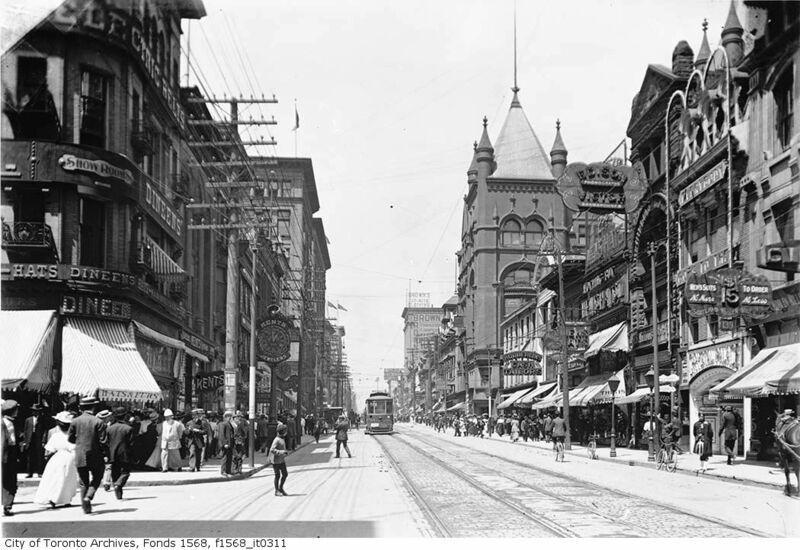 For example, on the left is a current photo of Yonge Street at Temperance. We can see the historic Dineen building and its ground-floor coffee shop. We also see four lanes of car traffic, with some road work taking place and a notable lack of pedestrian activity. On the right is a photo from the same corner circa 1903. We see the Dineen building in its original glory as a fur company. We see a streetcar heading our way but no private cars, which hadn’t yet been adopted en masse. We also see lots of sidewalk activity outside a diverse and inviting array of building facades and shop awnings. The project was led by Senior Software Engineer Dan Vanderkam (creator of OldNYC and OldSF) and Associate Product Manager Matt Breuer, with contributions from Jack Amadeo, Douwe Osinga, Sebastián Soto, Ryan Vilim and Alison Yard Medland. Several members of the City of Toronto Archives staff provided critical guidance. The images for the initial launch of OldTO all come from the collection of historic city photographs held at the City of Toronto Archives. The archives hold more than 1.7 million photographs dating back to 1856, and more than 100,000 have been digitized and made available online. The creators of OldTO did not collect or digitize any of these images—credit for that massive undertaking belongs entirely to the archives. Currently, clicking on a photo pulls up the information contained in the description of the archival holding, including (when available) the title, date, condition, and any copyright restrictions. Who holds the copyright for these images? Copyright information for each image held by the City of Toronto Archives is shown with the image entry. The archives gave digitization priority to images whose copyright is in the public domain, which means permission is not required for reuse. How did you map the images? The creators of OldTO used the titles of the photographs in the archives to assign the image a latitude and longitude—a process known as geocoding. For example, a photo titled “Yonge Street, looking north from Temperance Street” would be geocoded to the corner of Yonge and Temperance. Geocoding makes it possible to map the old images onto Toronto’s current street network, creating a new way to explore the collection based on geography. Geocoding isn’t perfect. Some of Toronto’s street numbers have changed over time—especially near the waterfront, where land reclamation pushed the shore line into Lake Ontario. One example is a 1928 image of a charming blockfront at “15 Bay Street”; today’s 15 Bay Street was nothing but green land at that time. It’s also possible that some addresses listed with the historic photographs were simply marked wrong. If you see an incorrect address in the collection, please email us. What else can this tool do? In addition to the existing map of street-level photographs, the OldTO engineering team plans to build an “aerial” button that will enable people to see how the city has changed from a bird’s-eye view. We’re also exploring some additional features, such as the ability to identify the various elements of an image through computer vision. That would enable people to search by keyword and pull up all the images with similar attributes, providing yet another point of comparison and exploration. I’m a developer who loves Toronto. Can I build on this tool? Please do! We’re also releasing the data for the project here: images.geojson. We suspect there are many creative uses of this data that we haven't thought of, and making the data open will help people come up with them. We’ve also released OldTO as an open-source tool, so local urban-tech enthusiasts or civic hackers can build on it or help us improve it. The source code for OldTO is available on Github. What data does this tool collect? What does this tool have to do with Sidewalk Toronto? The OldTO tool is not directly connected with the ongoing project plans for Sidewalk Toronto, but it does rely on some of the same technologies that can support a future neighbourhood. As we continue to build new prototypes, we will use them to explore the digital infrastructure needed for more substantial applications. OldTO also demonstrates the creative potential for open data and open digital infrastructure. We’re counting on you to let us know! You can use the feedback button to contact us, or reach us at oldto@sidewalktoronto.ca or via social media. Copyright © 2018, Sidewalk Toronto Employees Ltd. All rights reserved.